An Irish government Cabinet minister has told Pope Francis that the Catholic Church "should contribute substantially" to funding reparations for survivors of a former church-run orphanage where a mass grave of children's remains was discovered. Minister for Children and Youth Affairs Katherine Zappone raised the issue with the pope on Saturday during his weekend visit to Ireland. On Monday, Zappone released her remarks to Francis and a letter she gave him laying out background for the monetary appeal. Church-run homes in Ireland housed orphans, unmarried pregnant women and their babies for most of the 20th century. The institutions have been subject to intense public scrutiny since a local historian in 2014 tracked down death certificates for nearly 800 children who died at the former Bon Secours Mother and Baby Home in Tuam, County Galway — but could only find a burial record for one child. Investigators later found a mass grave containing remains of babies and young children in an underground sewage structure on the grounds of the home, which was run by an order of Catholic nuns and closed in 1961. DNA analysis of some remains last year showed the dead ranged from 35 weeks to 3-years-old and most were buried in the 1950s. "It is my strong conviction that given the role of the church in this shameful chapter of recent Irish history it must play a practical role in addressing the hurt and damage," Zappone wrote. "I believe that the church should contribute substantially to the cost of whatever option is decided by the government....Nothing less will demonstrate remorse." 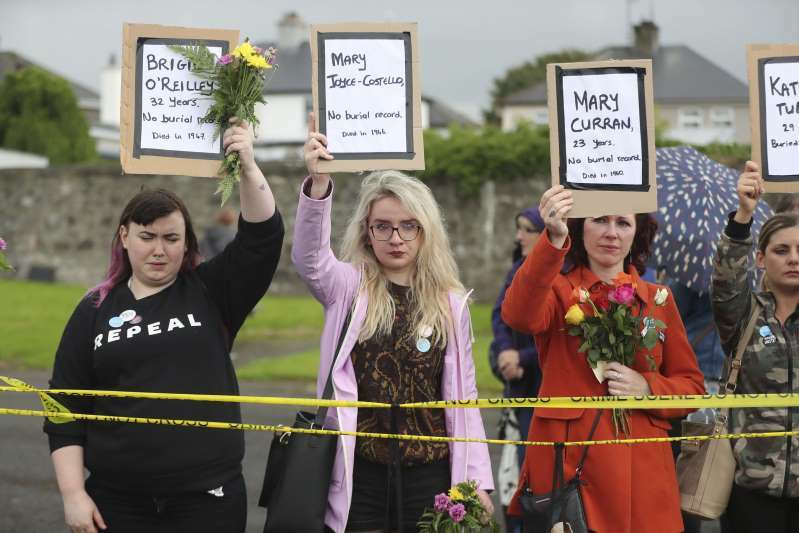 Hundreds of protesters marched through the town of Tuam on Sunday, reciting the names of the 796 babies and young children who died while residents of the home. They placed hundreds of pairs of infant shoes around a tiny white coffin at the burial site. Responding to a question about the Tuam home Sunday, Francis said he accepted Zappone's lament as "constructive collaboration" and that he would read a memo she prepared for him on the government's investigation. Francis met Saturday with some adult adoptees who were forcibly taken from their unwed biological mothers at birth. They urged him to denounce the practice, demand an apology from the religious sisters responsible and assure the mothers they could search now for their lost children without fear of sin. During a prayer Sunday in Knock, the country's main shrine dedicated to Christ's mother located not far from Tuam, the pope denounced how Irish children were "robbed of their innocence and taken from their mothers" during Ireland's years of forced adoptions. Some survivors also want to exhume the children's remains to give them a proper church burial. "There was little compassion shown to children and their mothers in this home," Zappone wrote. "We cannot change what happened to them. For the little ones whose remains are in a sewage system, we owe them dignity in death. For their mothers, siblings and families, we need to give them some peace."